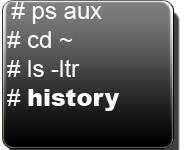 Bash history is very powerful. Understanding how to effectively use the bash history expansions will make you extremely productive on the Linux command line. Event designators – Refers to a particular command in the history. It starts with a ! This article is part of our on-going Bash Tutorial Series. As you already know, to view all the history entries, use the history command. This will display all the commands that were executed earlier along with the number for that command in the history table. If you’ve executed a command earlier, instead of re-typing it again, you can quickly execute it by using the corresponding number of the command in the history. For example, to execute command #4, do the following. This will display command #4 from the history, and execute it immediately. To execute a command that was typed 2 commands back, do the following. You can also press <Ctrl>-P (if you are in the default emacs mode) to get to the previous command. If you’ve enabled vi style editing for the command line using ‘set -o vi’, use <Esc>-k to get to the previous command. You can also use keywords to execute a command from the history. The following example will search for previous command that STARTS with the keyword “ps” and execute it. In this example, it picks up the previous command “ps -ef | grep http” and executes it. The following example will search for previous command that CONTAINS the keyword “apache” and execute it. In this example, it picks up the previous command “/usr/local/apache2/bin/apachectl restart” and executes it. In the following example, first we executed the ls command to verify a file. Later we realized that we want to view the content of the file. Instead of typing the whole file name again, we can just replace the “ls” in the previous command with “cat” as shown below. Word designators are very helpful when you want to type a new command, but use the argument from one of the command that was executed earlier. Some of the examples are shown below. In the following example, “!cp:^” was given as an argument to “ls -l” command. “!cp:^” locates the previous command in the history that starts with “cp” and gets the 1st argument of that command. The following example gets the 1st argument from the previous command. In the following example, “!cp:$” was given as an argument to “ls -l” command. “!cp:$” locates the previous command in the history that starts with “cp” and gets the last argument of that command. The following example gets the last argument from the previous command. In the following example, “!tar:2” was given as an argument to “ls -l” command. “!tar:2” locates the previous command in the history that starts with “tar” and gets the 2nd argument of that command. In the following example, “!cp:*” was given as an argument to “ls -l” command. “!cp:*” locates the previous command in the history that starts with “cp” and gets all it’s arguments. As we explained above, the “! ?apache” will search for the previous history command that CONTAINS the keyword “apache” and execute it. !% will refer to the whole word that was matched by the previous “?” search. For example, If you’ve searched previously “?apache”, the “!%” will match the whole word “/usr/local/apache2/bin/apachectl”. Note that “/” is treated as part of one word in this context. So, in this case, by executing the following, you can stop the apache. In the following example, “!tar:3-5” was given as an argument to “ls -l” command. “!tar:3-5” locates the previous command in the history that starts with “tar” and gets the arguments from 3 through 5. The following gets all the arguments from 2. !! :2* Gets all the arguments starting from 2nd argument. !! :2-$ Same as above. Gets all the arguments starting from 2nd argument. !! :2- Gets all the arguments starting from 2nd argument (except the last argument). Modifers are given after the word designators, as explained in the examples below. In the following example, “!! :$:h” takes the last argument of the previous command, and removes the trailing path name. In this case, it removes the filename, and gets only the full path. This is exact opposite of the previous example. In the following example, “!! :$:t” takes the last argument of the previous command, and removes all the leading path names. In this case, it gets only the file name. Instead of using the “^original^replacement^” as we discussed earlier, we can also use a sed like substitution in the bash history as shown in the example below. This might be easy to remember. !! is to call previous command, “:s/original-string/replacement-string/” is the sed-like syntax to replace a string. You can also use the g flag (along with s flag) to do global substitution as shown below. This is helpful when you’ve mistyped multiple word and would like to change all of them together and execute the command again. In the following example, by mistake I’ve given “password” twice (instead of passwd). To fix this, just do the following global history sed like substitution. If you’ve already executed a bash history substitution successfuly as shown above, you can repeat the same substitution quickly again using :&. I’ve by mistake typed “password” again instead of “passwd” in another command. Now, instead of retyping the command, or doing the “gs/password/passwd”, I can just use “:&”, which will reuse the last substitution. Use “:g&” for reusing the last subsitution by globally. This is very helpful when you are doing complex history substitution, and you want to view the final command before executing it. In the following example, “!tar:3-:p”, doesn’t really execute the command. Since we’ve given “:p” here, it just does the substitution and displays the new command. Once you’ve verified the bash history expansion, and if you think this is the command you intended to run, remove the “:p” and execute it again. i want to log every command run with any user in /var/log/message. Thanks a ton for sharing such great tips. Bash is so powerful and those tips are really going to help us a lot. This article is very fine I am new with linux Plz publish article based on server related as mail server and ftp,squid etc. I can’t believe! Your tips are the best! Thank you for turning our console life so much joyful. Thanks so much :D, nice tips. Thanks for sharing. Oh you could just vi bindings on the command and save yourself all that pain. in the daily usage of bash i tend to forget some of the features I use less! I also learned some new tricks from your post! I would not log this to /var/log/messages, use separate files. Man, I wish I learned all the word designators a long time ago! Thank you! Personally, I’m afraid to use some of these designators. It looks too easy to make an error and execute something I didn’t intend. But I guess point number #15 (Print the command without executing it using) addresses that. Don’t forget bash reverse history search ([CTRL]+[R] and enter string, keep pressing [CTRL]+[R] to scroll back) – it’s a bit more safe!